Beach Walk Cleaning ServicesMyrtle Beach Carpet Cleaning, Tile, Grout, and Upholstery Cleaning. Beach Walk Cleaning Services in Myrtle Beach is the area’s Newest and most Elite Rug Cleaner. Specializing in Carpet Cleaning, Tile & Grout Cleaning, Upholstery Cleaning, Stain & Pet Odor Removal. 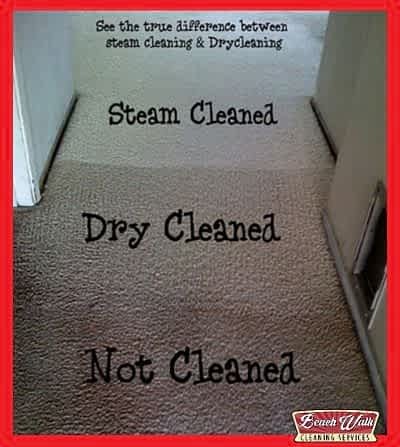 Did you know removing dirt & stains is not the only reason to have your home's carpet professionally cleaned? The carpeting in your home acts as a giant filter trapping fungus, bacteria, pollens, air pollution, smoke and other chemicals that are harmful to people. To ensure one's health, the carpeting in your home requires daily vacuuming and professional cleaning every 4 to 8 months. If your in need of Carpet Cleaning, Steam Cleaning, Dry Carpet Cleaning, Tile & Grout Cleaning, Upholstery Cleaning, Mattress Cleaning, Pet Stain or Odor Removal services in the Myrtle Beach area. Call Beach Walk Cleaning Services at 843-254-2420. One might think; that all Beach Walk Cleaning Services does is “clean carpeting & tile floors,” but what we really do is help others! Since opening for business in mid-2017, Beach Walk Cleaning Services has experienced rapid growth as a result of helping people remove the toughest stains, spills, spots and odors. What Has Led To Our Quick Growth? Functional Cleaning: All of our cleaning services are designed to clean & sanitize by dissolving soils, particles, contaminants, and pollutants so they can easily be rinsed off. Honest Accurate Pricing: No games or inaccurate pricing to get our foot in the door. We provide upfront accurate estimates each and every time. Improve Your Home’s Air Quality: In addition to making surfaces and fabrics look clean; it is important to remove soil, bacteria, allergens, pollutants, mold, and other debris from the home. Perfect for individuals who suffer from allergies or have pets. Child and Pet Friendly – Non-toxic friendly cleaning agents; free of chemicals, strong fragrances, and dyes leaving your carpet squeaky clean and free from allergens. Satisfaction Guaranteed – We stand behind our work; regardless if you’re a renter, homeowner or business owner. All our carpet cleaning services come with a 100% customer satisfaction guarantee. Beach Walk Cleaning Services is more than a Carpet Cleaner. We Brighten Area Rugs, Restore Upholstery, Whiten Grout, & Sanitize Mattresses. Advanced equipment which affords us many carpet cleaning techniques such as Hot Water Extraction (HWE), Steam Cleaning and Dry Carpet Cleaning. If you have questions regarding one of our cleaning services Carpet Cleaning • Tile & Grout Cleaning • Upholstery Cleaning • Stain & Pet Odor Removal feel FREE to call us at 843-254-2420. Complete the form below and click the “Book” button and someone will respond to you shortly Or, call us at (843) 254-2420.